Most pros these days have decided to implement an off-season which is nothing what a true off-season used to be. They get lazy and fat, but Shawn truly takes this time to add some quality new muscle mass. It's all about common sense when you implement a true quality bulking off season diet plan. Mr Rhoden takes us through several common sense steps to make the best muscle gains possible in this window. 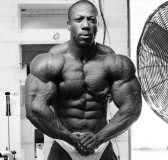 When it comes to following your favorite pro bodybuilders, most usually look for advice regarding their best muscle groups. But that is from genetics.. and no advice or tips will help you match their quality. It's usually those muscle groups that were horrible to start and brought up with hard training that the advice is needed. This is Shawn's worst muscle group.. his back. While still amazing, he keeps improving. T-Bar Row - First exercise instead of the last, full range! Dumbbell Rows One-Arm - Fully concentrate and squeeze! Deadlifts in the Rack - Helps to dramatically thicken up! Cable Rows - Bring to lower abdomen area!